← What Is The Greener Option – Reusable Razors or Disposable? You can obtain an exact measurement of nearly every aspect of a vehicle. The numbers for leg room, head room, weight capacity, even the cargo capacity are tangible and exact. Despite all of those tangibles, fuel economy is still only an estimate. Everyone in the realm of the automobile, from automakers to analysts to buyers, have shaken their heads over the difference between the EPA’s estimates and real world results. And, in 2012 alone, both Kia and Hyundai were found guilty of misstating their vehicles’ fuel efficiency by up to 15 percent, while a California woman was awarded nearly $10,000 when she sued Honda in small claims court for overstated mpg claims. Keep in mind that 15% might not sound like a big deal, but for a 25 mpg vehicle, it’s a difference of 3.75 mpg! Most consumers and critics have been placing blame on the automakers themselves. After all, manufacturers conduct their own mpg testing, and then report those results to the EPA. The EPA only confirms about 10-15% of these results through their own laboratory testing. However, coming up with an accurate mpg estimate is a bit harder for automakers than you might think, simply because there are so many factors at play. Let’s take a look at a few reasons why your vehicle’s actual fuel economy may not add up to the advertised fuel estimates. We all know that city driving lowers fuel economy. The time spent idling at stops, as well as the constant speeding up and slowing down, burn fuel at a greater speed than highway driving. Another factor that will drop your fuel economy under any conditions is you. How fast do you get to speed, do you use cruise control, do you change lanes frequently? Frequent lane changes and rapid acceleration will drain fuel economy numbers. Have you ever driven a vehicle that has a mpg estimator in the dashboard display? If so, you’ll quickly realize that the fuel efficiency of even the smallest econobox will drop below 10 mpg during vigorous acceleration. Using your cruise control to maintain a constant speed will improve your mpg. The weather will rob your fuel economy as well. Cars tend to release small amounts of unburned fuel and operate more inefficiently during cold weather. Also, people tend to over-estimate how long they need to let their car run for it to warm up. Modern cars do not need very long to warm up, even in cold weather. Do you live in an area where you are forced to drive on an incline frequently? Guess what, your fuel economy suffers for it. You will be forced to accelerate more often to maintain a steady speed, causing you to burn more fuel. This can be a major factor in many areas that aren’t necessarily mountainous, but which do have rolling hills or lots of bridges. No, gas stations are not selling dirty gas, but some gasoline varieties are cut with more ethanol than others. Burning gasoline that contains 10 percent ethanol (known as E10) will lower your fuel efficiency by up to 3-4 percent according to the EPA. Try to use gasoline that only contains about 3 percent ethanol in order to boost your fuel economy. 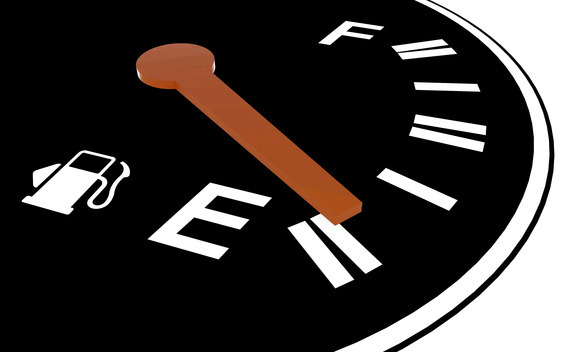 The EPA bases its fuel economy estimates on the use of nearly pure gasoline. Little things like a dirty air filter and tires that are improperly inflated can rob up to 15 percent of a vehicle’s fuel efficiency. Add to that a past due tune-up and you could be losing as much as 30 percent of your vehicles potential fuel efficiency. The EPA has a website set up so that consumers can report their real world fuel efficiency results. Hop over to fueleconomy.gov to view the experiences that others have had or to share your own. Additionally, the EPA is working on refining its fuel estimate formulas to account for higher ethanol content, driving conditions, and new technology in order to offer better information in the future. Guest Author Bio: Author Jerry Coffey, a long-time debt addict, paid off over $10,000 in credit card in two years through frugal-living and sound money management. Now he blogs regularly at Repaid.org, and he’s a frequent contributor to AutoFoundry.com as well. We have a Prius and it does way better when it’s warm out. In the winter, it can get as low as 40mpg but in the summer it gets more like 50mpg. Holly, a difference of 10 mpg is shocking to me. On the bright side, you are still getting 40 mpg at the worst of times.